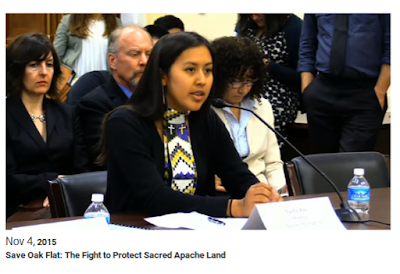 Listen to the testimony in Washington on the Defense of Sacred Oak Flat and what it means for the protection of all sacred places. San Carlos Apache Chairman Terry Rambler, Apache Stronghold Wendsler Nosie, Apache youth Naelyn Pike, and more. Public lands, like Oak Flat, are carved out of the ancestral homelands of Indian tribes, and the historical and spiritual connections of Native Americans to these lands have not been extinguished. 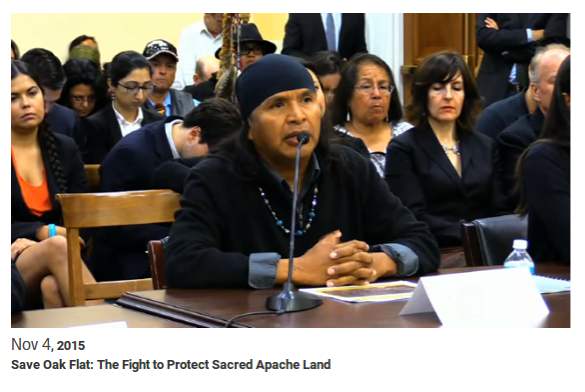 The United States has legal and moral obligations to provide access to Native Americans and to protect these traditional territories in a manner that respects the cultural, historical and religious importance to Indian tribes. 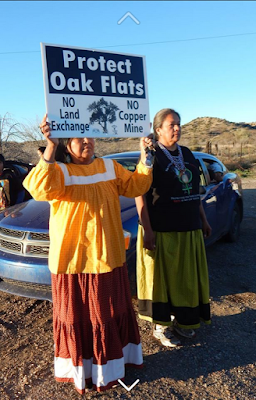 CALL OBAMA AND TELL HIM TO MEET WITH NAELYN PIKE ON THE SAVE OAK FLAT ACT AND THE PROTECTION OF SACED SITES! Join Naelyn Pike and support Apache Stronghold in a forum on protecting Oak Flats, sacred Apache land, and other sacred sites,on public lands. 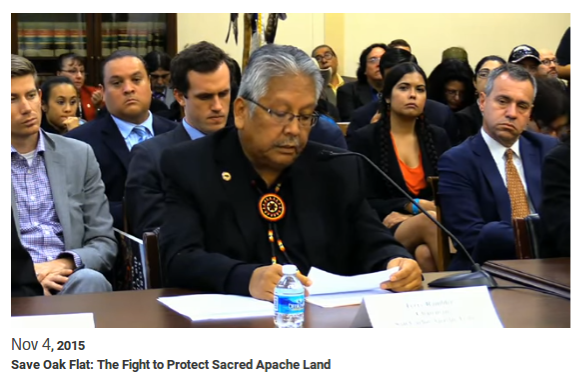 Beginning November 1st Apachestronghold will be Traveling from Oak Flat to DC to meet with House Natural Resouce Committee Ranking Member Raul M. Grijalva as well as other members of Congress for a HIGHLY NEEDED Panel with Congress on securing sites that have cultural ties to tribes. 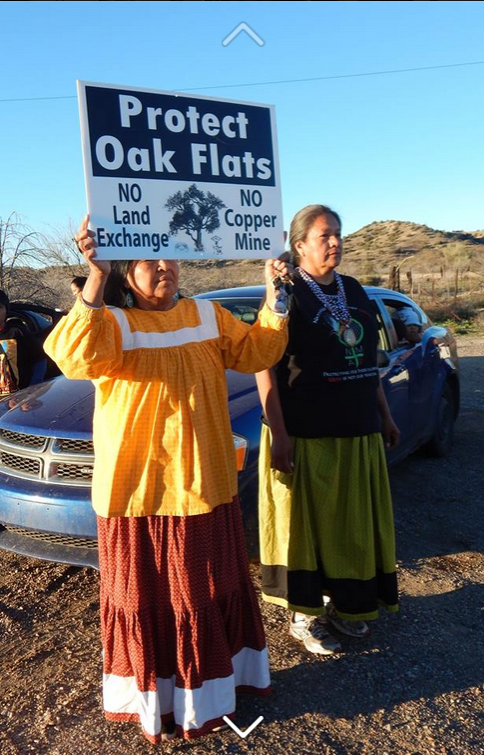 Who is opposed to the Save Oak Flat Act and a major opposition in the Congress? Arizona Sen. John Mccain(R) is the longest serving member of the senate comittee on Indian Affairs and Arizona Sen. Paul Gosar (R) a member of House Committee of Natural Resources. The Subcommittee on Energy and Minerals Resources have been in support of tribal self determination, but violated the rights of the Apache people and sets precedent for mining companies and the federal departments by leasing tribal/public lands in the name of "National Defense". Our sacred land is now up for lease and under threat to extractive mining companies foreign and domestic. With the American Indian Energy Act giving Tribes the opportuniy to sign off on mineral mining and energy plans which tie leasing of land and minerals, which those actions then result of a growing division between our communities and of our ancestral histories and practices. We demand Congress to learn more about Sacred Sites issues within public lands and declare them to remain unharmed and be given back in full title to the tribe(s). These actions will protect our rights and delcare us Sovereign Nations and identify us as unique individual tribes when it comes to Government to Government or Government to Business relations. It is time President Obama started taking care of Native Americans rights, he is letting prisoners out of prison. Now it is our time free Leonard Peltier, and give us our land. It is not your's to do as you please Hands off.